In our home like many homes in the world breakfast is the most important meal to us. You can find me cooking up a storm on the weekends making a breakfast feast fit for a king! I don’t make French Toast too often only because it’s my husbands least favorite breakfast dish. I never make stuffed french toast and only order it when we are out at restaurants. So this was a major treat for us — well me. 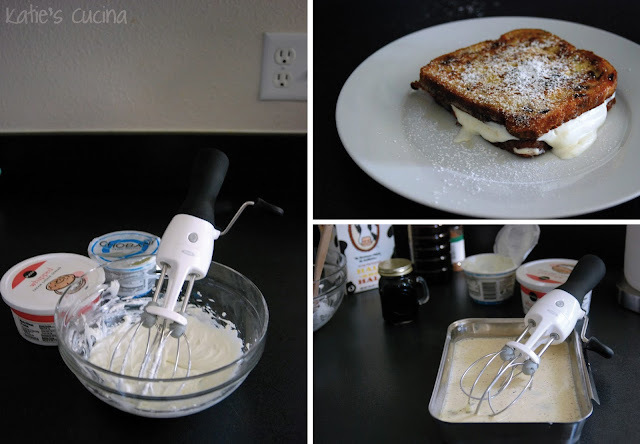 I used my OXO Good Grips Egg Beater to not only whip of the cream cheese filling but also the egg mixture. Don’t be scared to make such a luxurious breakfast treat! The key is to not over soak the cinnamon raisin bread, and to over stuff your french toast… which is ok, since that is what I did since I LOVE the filling so much! In a bowl combine yogurt, honey, cream cheese, and powdered sugar. Whisk until well combined and fluffy. Whisk together milk, eggs, nutmeg, and vanilla; pour into large shallow dish. Preheat large sauté pan on medium 2–3 minutes, then place butter and oil in pan. Quickly place 4 bread slices in egg mixture; turning quickly so that the bread is moist. Then carefully place bread in pan; cook 2–3 minutes on first side or until golden. Flip bread over, and spoon 2 tablespoons cream cheese mixture over two (of the four) slices of cooked bread; cook 1–2 minutes or until golden. Assemble with one slice of each; remove from pan and cover to keep warm (or serve immediately). Repeat with remaining bread. Dust powder sugar on before serving. Serve with maple syrup if desired. I love stuffed french toast and this looks great!! I have that oxo beater and I love it. Your french toast looks so delicious. I am hungry and it sounds so good. Amazing looking french toast. I have the OXO beater and I love it.